This article features the entire schedule for Randy Santel’s Northwest USA Winter Tour which he updated throughout his trip so that everyone was able to follow along and know when, where, and what time all of his food challenges were. 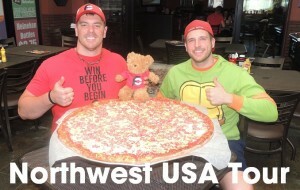 From Monday, December 26, 2016 through Saturday, January 14, 2017, Randy Santel and “Magic Mitch” Dombrowski traveled all around the northwestern half of the United States spanning from Wisconsin all the way to Oregon and Washington. Randy got food challenge wins in seven new states including North Dakota, Montana, Oregon, Idaho, Utah, Wyoming, and South Dakota. He also got additional wins in Wisconsin, Minnesota, and Washington. For future updates on future challenge tours, please follow Randy Santel via his Facebook, Twitter, and/or his Instagram page. You can also follow Magic Mitch’s Facebook, Twitter, and/or Instagram account(s) too for his updates. This page now includes links to watch all the challenge videos we filmed during the trip. Click on the challenge that you are interested in and you will then be able to watch that video via YouTube. Thank you for watching!! Thank you for checking out Randy & Mitch’s Northwest USA Winter Tour Schedule! !